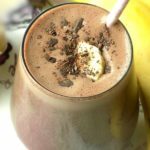 Today I am sharing my chocolate peanut butter banana smoothie that is thick, chocolaty, healthy and sweet enough to stop your sweet cravings. 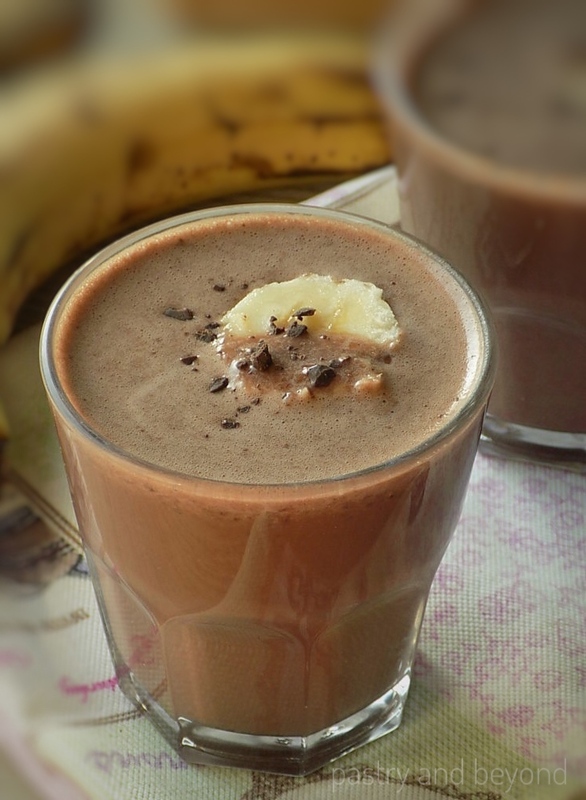 You need simple ingredients; milk, banana, peanut butter, cocoa powder, honey. Milk- You can use your milk of choice according to your diet. 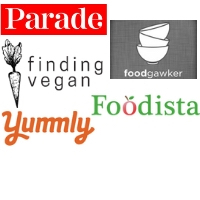 I use cow milk. It is rich in protein, omega-3 fats, vitamin B, vitamin D and antioxidants. You can read the benefits in detail at Organic Facts. Banana: Rich in Vitamin B6, Vitamin C, potassium, antioxidants. You can read more at Healthline. Peanut Butter: Rich in antioxidants, vitamin B3, vitamin B6, Vitamin E. You should eat peanut butter no more than 2 tablespoons to get its benefits. You may want to read this article. Cocoa Powder: Rich in antioxidants, lowers high blood pressure, improves brain health. You can read more at Healthline. Honey-Rich in antioxidants, boosts the immune system. This recipe makes 1 large or 2 regular servings. Normally I don’t like eating ripe bananas but when it comes to smoothies, I use ripe bananas. When your bananas are ripe, slice them and keep in the freezer. You can use them in your smoothie. These bananas will not only make your smoothies thick but also they will naturally sweeten your smoothies. Ripe bananas are great for banana bread too. I place the milk, frozen banana slices, cocoa powder, my homemade peanut butter, honey into the blender and blend until they all combined for almost 1-2 minutes. Then I add the ice cubes and blend until they are crushed. I prefer to add the ice cubes at this stage to keep my smoothie cold. 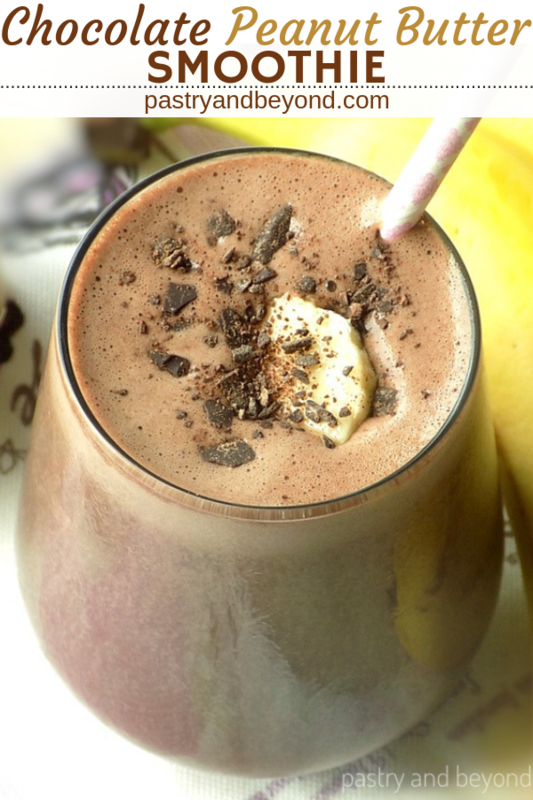 You can decorate your smoothie with a slice of banana and grated chocolate. Enjoy! 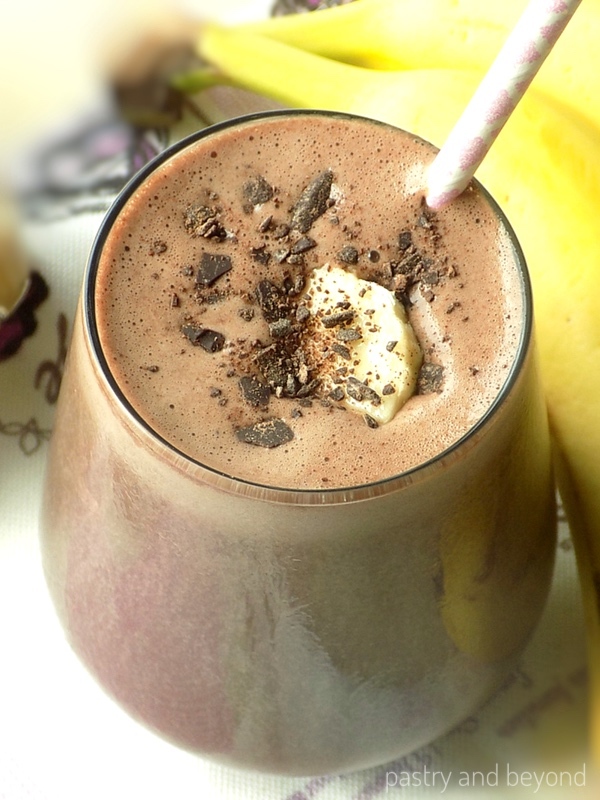 This healthy chocolate peanut butter banana smoothie is thick, chocolaty, sweet enough to stop your sweet cravings. It will be ready in less than 5 minutes! 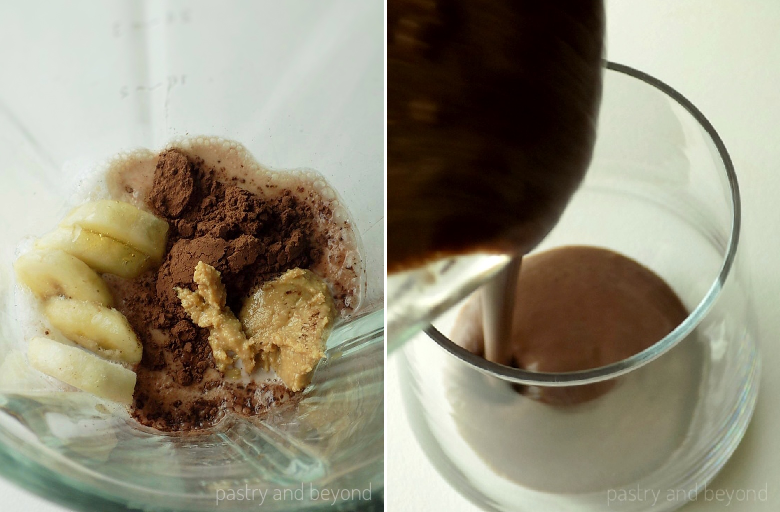 Place the milk, frozen banana slices, cocoa powder, peanut butter, honey into the blender and blend until they all combined for almost 2 minutes. Add the ice cubes and blend until they are crushed. 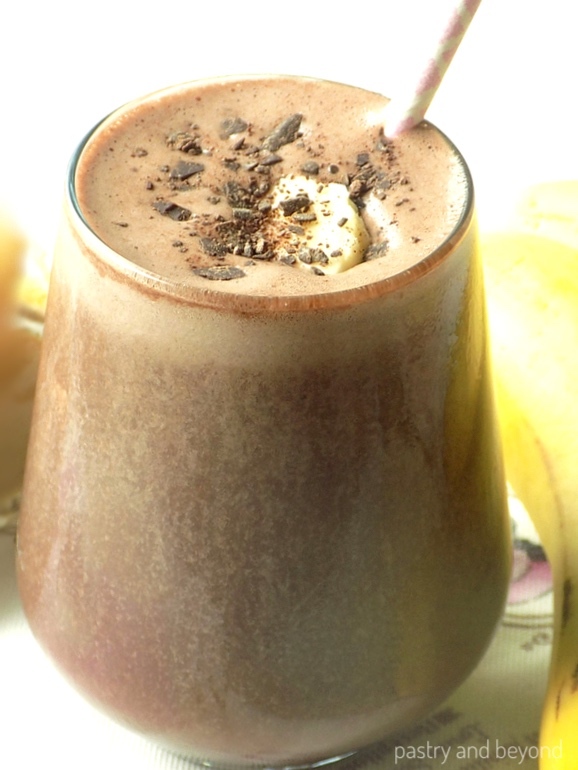 If you like, decorate your smoothie with a slice of banana and grated chocolate. *2 tablespoons is very chocolaty, you can start with 1,5 tablespoons and taste before you add the ice cubes. If you prefer you can add other 1/2 tablespoon. **As I use a ripe banana, 1 teaspoon of honey is enough. Taste your smoothie before adding the ice cubes. If you want to sweeten more, you can add more honey. The calorie information above is (calculated per 1 regular glass) an estimate that is provided by an online nutrition calculator.